This week I traveled to Jamaica for a short visit to oversee the renovations at our family rental house. I was tired from standing all day and breathing in paint fumes and needed a nourishing meal to pick me up. While in between meetings I took a quick taxi ride to Hopewell, the nearest town, to buy some ackee, breadfruit, coconut and okra, from the roadside fruit stall at the main junction in town. 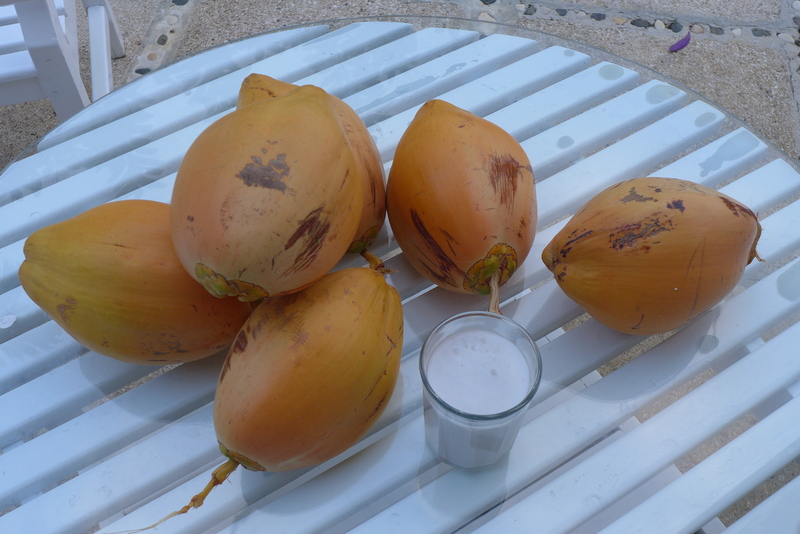 It was such a treat to sit down to this delicious nutritious meal of local, organic vegetables made by our amazing cook, Ana, accompanied by a glass of refreshing coconut water. The ackee, tomatoes, okra and plantain were sautéed in extra virgin coconut oil from Belize which I bought in Ocho Rios at Progressive Foods supermarket—a chain of supermarkets selling a wide range of local and organic foods, part of a growing organic movement in Jamaica. The lettuce was from a local organic farm and our driver Kenny picked the avocado for me from the tree in his garden. For years, while growing up and throughout my twenties, I had to settle for low quality, imported food when I came here but now that I come so often, since managing our house, I have found the resources for local, organic food and it has made all the difference to my experience and the way I feel. Along with my morning hour of running, swimming and yoga, instead of getting fat and tired like I used to, I stay in shape and feel great. I had the honour of sitting next to Sally Fallon, president of the Weston A. Price Foundation, over dinner last week at Hearth Restaurant in New York City. Chef Marco Canora, who has become a celebrity with his take out broth window, Brodo, hosted the dinner which was made entirely according to the principles of the Weston A. Price Foundation, as illustrated in Sally Fallon’s cookbook, Nourishing Traditions. Sally Fallon has a devout following all over the world since she started the Weston A. Price Foundation, a dietary philosophy, based on the teachings of Weston A. Price. Weston Price was a dentist who traveled the world in the 1920s and ’30s, studying the diets of indigenous tribes and found that they had perfect bone structure and no tooth decay or disease. I first read her cookbook Nourishing Traditions eight years ago and I have been on the Weston Price diet ever since. Sally Fallon has changed my life and the life of so many others by improving their health, so this was a very special and rare opportunity to talk to her. The table was beautifully set on a long table in the private dining room and lit by candles. The dinner was five courses, each accompanied by a different wine. Sally stood at the beginning of each course to make a speech, the theme being reduction sauces, followed by Marco explaining each course. The first course was a tasting of each of Brodo’s bone broths: grass-fed beef with ginger, Pennsylvania Amish organic chicken and Hearth broth; a combination of their chicken, beef and turkey. The second course was a trio of root vegetables, wild salmon eggs, Finger Lakes farm cream, chicories and a beet kvass vinaigrette. The third course was a sprouted grain risotto (lentils, red fife wheat berries, red quinoa) cooked in Hearth broth with wild mushrooms, cabbage and grated Spring Brook Reading raw cow’s milk cheese. The fourth course was a seared calves liver, bone marrow, soft scrambled eggs and alliums cooked in a Bordelaise sauce. Marco pointed out that the liver was from a rare veal from Vermont, fed only mother’s milk and grass instead of powdered milk. The fifth and final course was a selection of three raw milk cow cheeses, served with hazelnuts, sliced pears and honey. The blue and cheddar cheeses were from Sally Fallon and her husband Geoffrey Morell’s own organic bio-dynamic farm, Bowen Farm. I have been to many great restaurants in my life and I would say this was one of the best, if not the best dinners I have ever had. It was unique in that it was not only cooked to perfection but also using ingredients of the highest quality. This rare combination was what made the dinner so memorable. Once you are on a real food diet and are used to the superior taste of real food ingredients sourced from grass-fed animals and organic farms, there is no comparison to conventional food, even when it is cooked by well known chefs. It is this combination that has made Marco Canora’s Hearth Restaurant such a success. When I read in dismay about the increasing use of pesticides, GMOs and other chemicals, how bees are becoming extinct and nature’s perfect food—breastmilk—is contaminated with toxins such as BPA and fire retardants, I feel hopeless and think we are heading towards total destruction of our planet. Sometimes however, I see a light at the end of the tunnel and believe the tide is turning, that we are finally winning the war against processed, chemical ridden food and GMOs which are poisoning our children. I keep reading in the news about McDonalds sales continuing to drop. Perhaps the day I have been waiting for, when we will see an end to the infamous McDonalds we all grew up with and places like fast-growing burger chain Bareburger replacing it, is nearer than we think. 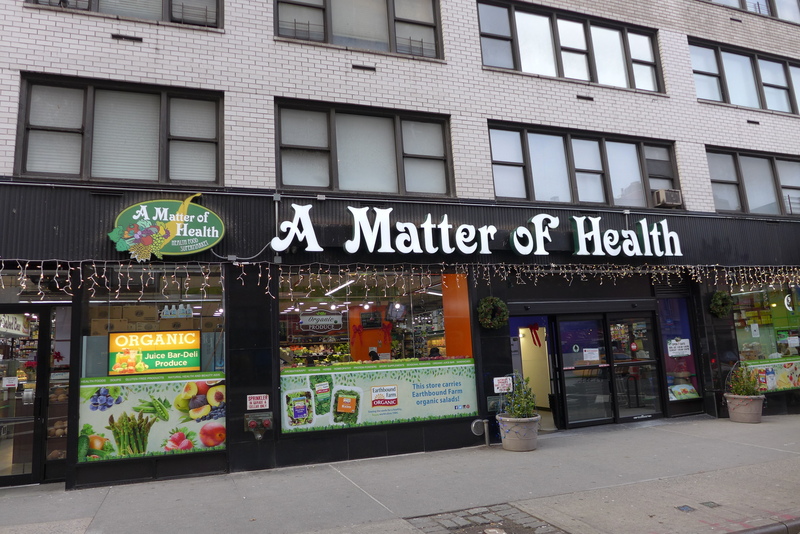 On a recent trip to New York I came across the new supermarket, A Matter of Health, on First Avenue between 72nd and 73rd streets. I was impressed with how many products they had in stock and how much variety there was. They sold many products that are hard to find, that I usually have to order online or go to various different stores to buy. 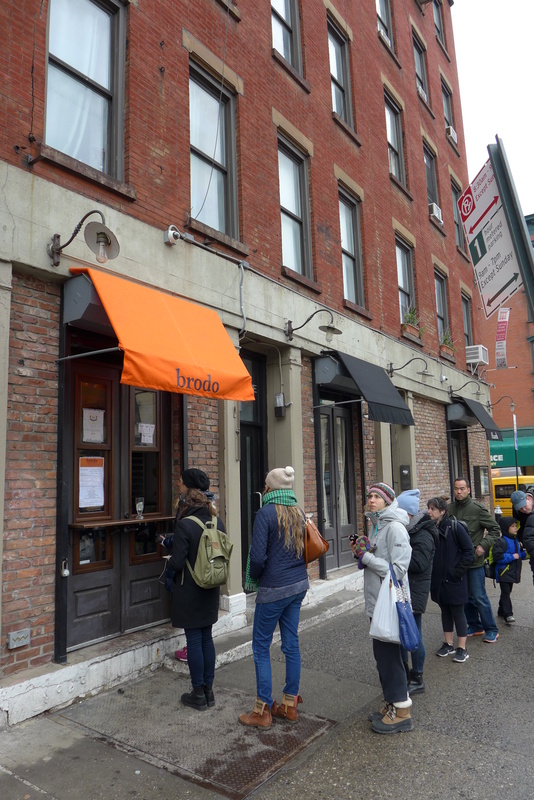 It impressed me that a neighbourhood like the Upper East Side which has been slow to pick up on the growing real food movement, with few healthy restaurants and markets, is catching up with the more foodie-forward areas of the city such as Williamsburg and Downtown. Also on the Upper East Side, on Lexington Avenue between 73rd and 74th streets is Organic Avenue, opened three years ago, where I get my breakfast each morning when I stay there. Organic Avenue was the first juice bar of its kind; Juice Press in New York and Jugo Fresh in Miami were soon to follow. On my way back to Miami at La Guardia airport, I stopped by the market Cibo Express, which I was also impressed to find were selling some healthy food products such as Vigilant Eats superfood cereals and Maple Hill Creamery 100% grass-fed organic yogurts. A few years ago you could never find a healthy snack other than a banana in any airport. In Miami the long awaited Wholefoods Downtown opened in Brickell last week, with yet another branch of Jugo Fresh located inside, as soon as you walk in. With so many new health food markets opening on a grand scale, such as Wholefoods (the first national grocery chain to set a deadline for full GMO transparency) and A Matter of Health, we may be seeing the end of the average conventional supermarket. Here is a typical example of false marketing. Hershey’s ice cream and its ingredients are definitely not real. I know because I contacted the company to ask if their milk comes from cows treated with the growth hormone rBST and they replied that they do not require rBST free milk from their sources, in other words, yes. Examining the ingredients of two popular flavours, vanilla and chocolate, the first five ingredients are genetically modified, followed by two natural ingredients (vanilla extract and whey or in the case of the chocolate flavour, cocoa and whey), followed by four emulsifying additives. They do use cream as a first ingredient, which is better than most conventional ice creams, however it is from cows treated with hormones as well as from cows eating GMO corn and soybean, instead of grass, which is what cows were designed to eat. The second ingredient is nonfat milk, again from cows treated with rBST. The third ingredient is high fructose corn syrup: a highly concentrated form of fructose, responsible for the alarming rate of heart disease and obesity in the U.S. The fourth ingredient is sugar, which now comes from GMO sugar beets unless it is labeled as ‘cane sugar’. The fifth ingredient is corn syrup from GMO corn. The last four ingredients are a combination of natural and synthetic emulsifiers: mono and diglycerides, guar gum, polysorbate 80 and carrageenan. Mono and diglycerides contain trans fats and are used to extend shelf life. They are replacing hydrogenated oils in processed products because they don’t need to be labelled as containing trans fats. Polysorbate 80 is a synthetic surfactant and emulsifier used in cleaners and personal care products, which is contaminated with the carcinogen, 1-4, Dioxane. In a recent study by Nature it has been proven to cause colitis and metabolic syndrome (obesity) which leads to chronic digestive disorders such as type 2 diabetes, liver and heart disease. I doubt any of these ingredients were used to make Hershey’s ice cream in 1894. The only real ingredients are vanilla extract and cocoa. 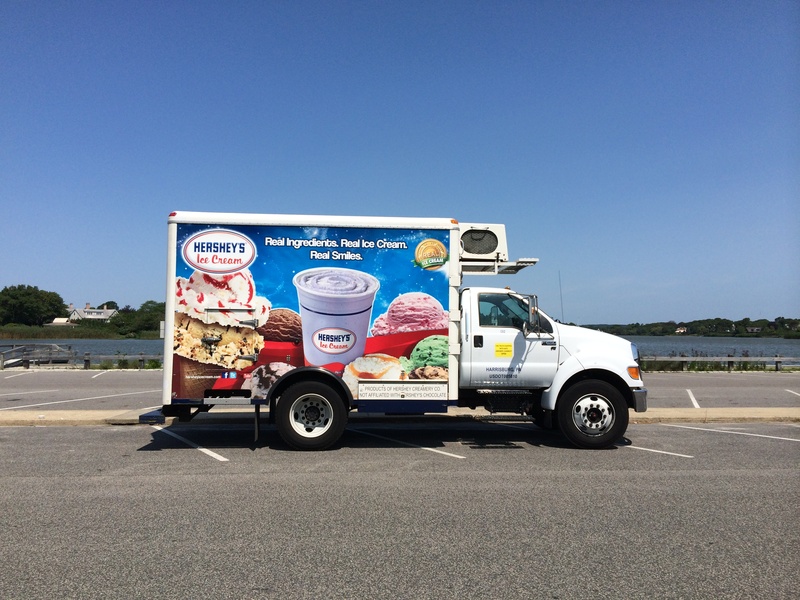 While Hershey’s may be better than some other ice cream brands like Carvel, as you can see, Hershey’s ice cream is everything BUT real. 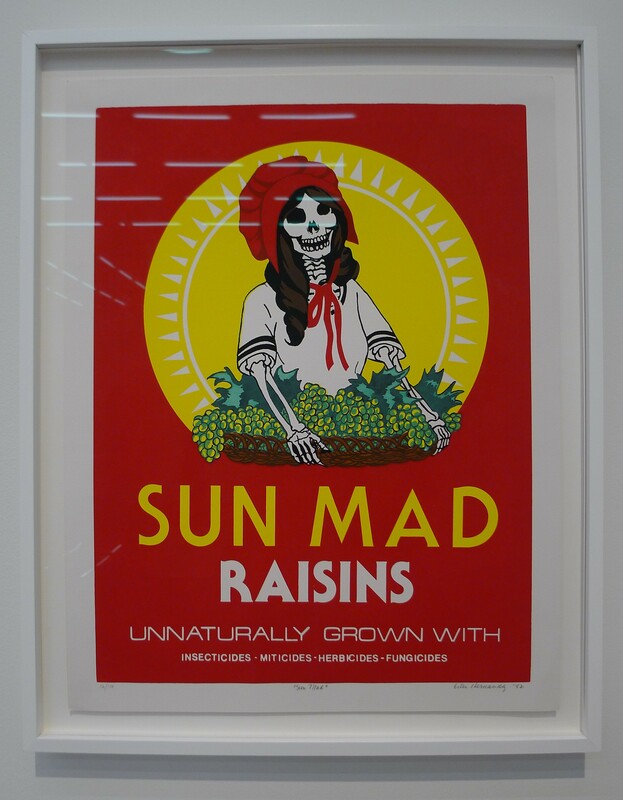 At the Pérez Art Museum in Miami, I came across this silkscreen print by artist Ester Hernandez, brilliantly portraying the deception of health food marketing. The artist produced the silkscreen in 1982 to address the unfair wages and poor working conditions, particularly exposure to toxic chemicals, of the Mexican migrant workers harvesting grapes in the San Joaquin Valley, California. Coincidentally, just a few days before seeing this print, I learned to my horror that my daughter’s school, which has a strict organic food policy, were serving Sun Maid raisins to the kids as a snack. I don’t usually eat raisins as they are high in fructose (I would rather save my sweet treat for something more delicious), they get stuck in your teeth and can cause cavities. However, I would never go near non-organic raisins such as Sun Maid raisins, as grapes are one of the fruits with the highest number of different pesticide residues. According to the Environmental Working Group and their latest 2014 data on pesticides in produce, a single grape contains 15 pesticides. 1. American Academy of Pediatrics Council on Environmental Health. Pesticide Exposure in Children. Available from http://www.aap.org. [26 November 2012]. 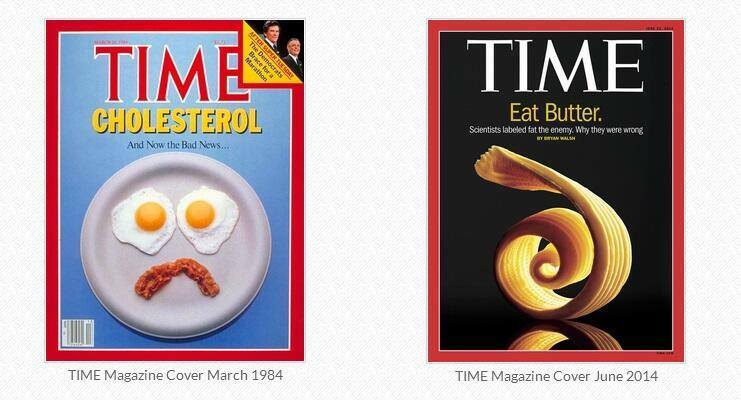 After 30 years of bad advice we are finally seeing an end to the war on fat. My second real food stop in Buenos Aires was El Galpón farmers’ market in Chacarita, which I was more impressed with during this trip than Sabe La Tierra in San Fernando. Here I was finally able to find raw grass-fed milk and yoghurt! They came in glass bottles and I found them at La Azucena stall, owned by Walter and his father Nestor. They only bring two bottles of raw milk to the market each time for the few customers who buy it so I got lucky. Usually you have to call in advance and order it. The milk was much creamier than our Amish grass-fed raw milk in the U.S. and had a richer flavour. Walter explained to me that the milk would need to be boiled after two days, which I found strange because our Amish milk lasts at least a week. I thought he was being overly cautious as most people are afraid of raw milk but sure enough it did start to sour after two days. However, it didn’t sour in the same way as our raw milk sours which usually gets a bitter taste and curdles, it became thick and developed a pleasant tart flavour like buttermilk. As time went on the flavour stayed the same and the milk got thicker. I did not need to pasteurise it as it comes from roaming grass-fed cows, eating what they are designed to eat and therefore not sick like grain-fed, confined cows. The fact that it had such a pleasant taste meant it was free from any harmful bacteria. If milk has bad bacteria it smells foul, such as when pasteurised milk goes bad, it doesn’t sour like raw milk, because all the enzymes which would otherwise ferment the milk and turn it sour, producing more beneficial bacteria, have been destroyed by the heat process of pasteurisation. At La Azucena they sell cow milk, goat milk, cow yoghurt, goat yoghurt, aged and soft cheeses as well as chicken, chicken eggs, quails eggs, salami without preservatives, pork, bacon, sausages, pollen and honey. The cheeses unfortunately are not raw. Their farm is in Las Heras; their cows are purely grass-fed and their chickens are pastured and also given leftovers from the vegetable garden and some non-organic corn (which could mean it is GMO). I went back to the market the following week and bought more raw milk, as well as salami and cheese. The milk again soured after two days which was problematic considering my daughter refused to drink it after it soured and I was not able to go to the market again until 2 days later, but it was still delicious and a breakthrough to have finally found a source for raw milk in Buenos Aires. At the Granja Organica de Arroyo del Medio stand they sell organic pastured eggs, salamis made without preservatives using pastured meats and homemade mustard, pesto, hummus, and eggplant pate. Territorio Cuyano sells organic wines. At Grupo San Juan there is a wide array of organic vegetables: mostly greens, some fruits and local blueberries. La Choza, which is also at Sabe La Tierra market, sells organic pasteurised, grass-fed milk, yoghurt and cheese. Cumulen stand sells ice creams made from grass-fed milk, carefully sculpted in the Argentine tradition onto cones, which come in a variety of different natural fruit flavours. There is a very good cafe at El Galpón where they serve organic salads, pastured grilled meats, whole grain alternatives to the classic Argentine pastries such as empanadas and tartas as well as whole wheat pizzas and pastas (my favourite being beet ravioli when in season), all from local farms. They have fresh organic juices such as passionfruit, peach, blueberry and mulberry. El Galpón is held every Wednesday and Saturday next to the Federico Lacroze train station in Chacarita. When I first started going to Buenos Aires seven years ago, it was very difficult to find real food. Even the grass-fed beef Argentina is known for worldwide, was quickly being replaced by feedlot beef. In the supermarkets it was impossible to find plain yoghurt; everything was loaded with sugar and additives. There were a few health food stores and restaurants but they were still stuck in the old school belief that soy and vegetarianism is healthy. Argentines eat mostly bread in the form of pasta, pizza, sandwiches and pastries, with meat, cheese and few vegetables, which made it very difficult to eat well when I was there. However, when I returned in 2010 to visit my in-laws, things had changed. There were now several organic food delivery services and more health food stores and restaurants, but the biggest change was the opening of two farmers’ markets: Sabe La Tierra in San Fernando and El Galpon in La Chacarita. Now when I visit, as soon as I arrive I go to the nearest market to stock up on real food, which has made eating healthy a lot easier when I am there. During my recent visit in November, my first stop was Sabe La Tierra in San Fernando. 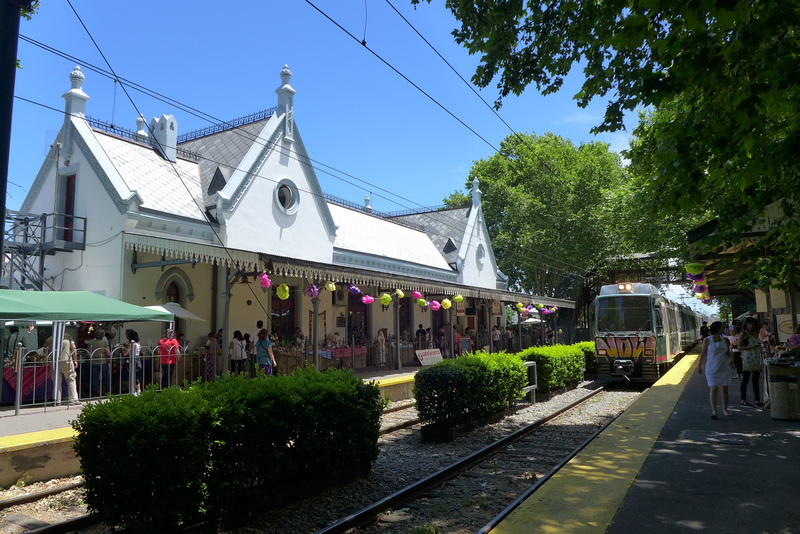 The market is held every Saturday at the charming San Fernando, Tren de la Costa train station, where the stalls are set up along the train platform. The most impressive stall is Tierra Florida, owned by Fabio, who sells medicinal herb tinctures and makes various smoothies, using fruit mixed with water kefir, kombucha or coconut milk and adds superfoods such as pollen, cacao, maca, aloe, purple corn, ginger, coca and moringa. Fabio has had his stall at the market for two years. The movement still has a long way to go in terms of real food and there is still a big emphasis on vegan and vegetarianism. There is no raw cheese or raw milk being sold at the market, only pasteurised, partially grass-fed organic yoghurt and milk from a cooperative of small farmers called La Choza. At the Coeco stall, another cooperative, their chicken and eggs are marketed as pastured but the chickens are fed grains which most likely are GMO as they are not certified organic and the hens are fed GMO soy. I spoke with the owner at Coeco who told me that in March their eggs are going to be certified organic—a huge improvement. Another stall owned by a lady named Susanna, at the end of the platform, also sells eggs; the hens are fed herbs, corn and some commercial feed but again these probably include GMO grains. Since Argentines have started learning about the effects of GMOs from soy, their largest producing crop, there is pressure for producers to have their products certified organic, as most are still getting away with marketing them as healthy and organic when they are fed GMOs. Across the train tracks at La Cañada stall, there is always a long queue of people waiting to buy their organic fruits and vegetables. Here they sell local organic blueberries, the ones imported all the way to the U.S. during the winter months when blueberries aren’t available. A few stalls further along there is La Areperia de Buenos Aires. An arepa is a Colombian and Venezuelan cornmeal patty which is grilled or fried and then sliced and usually stuffed with cheese. What differentiates La Areperia de Buenos Aires from the typical arepas you find in the U.S. is that they are made in the traditional, rustic style, using corn kernels that are first boiled and then ground, instead of cornmeal, to produce a more flavourful arepa. The arepas look delicious but when I asked the owner, Hassan, if the corn is organic, his answer was vague. He told me that his producer says it is organic but it isn’t certified, in which case I wouldn’t take the risk, as most corn is GMO. The health food movement in Argentina has grown tremendously since my last visit, with hopefully more certified organic products to come. 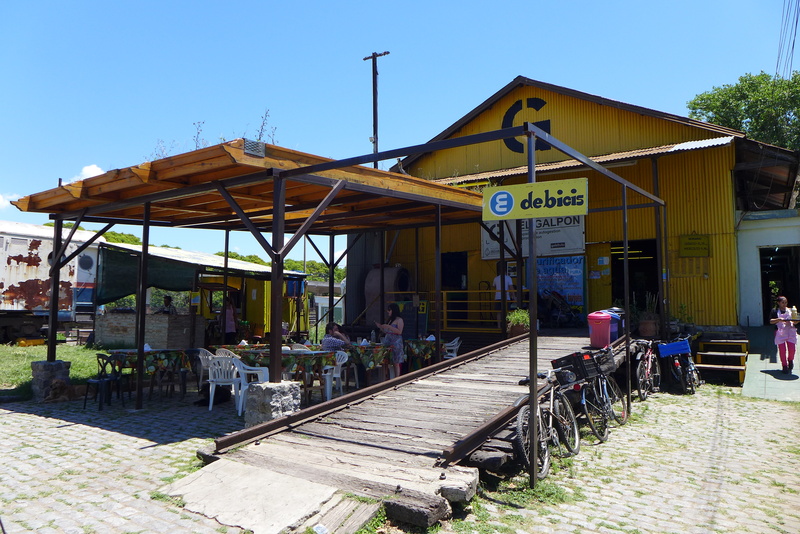 Sabe La Tierra market is now held at two more locations, in Tigre on Wednesdays and in Vicente López on Saturdays. As of January this year, Sabe La Tierra started Mercado de Noche, a night market held at different locations from six till ten in the evening. Another market which I have not been to yet, Buenos Aires Market, is held every month since April 2012, at various locations for two days over the weekend, selling organic and healthy food.